If you’re serious about geocaching, than you’ve probably heard of benchmark hunting. But just what is a survey benchmark? Survey benchmark monuments are brass or metal disks in the ground. They measure exact horizontal positions (latitude and longitude) on the Earth because this gives surveyors a point of reference. Some benchmarks also measure elevations. These types of benchmarks indicate the height above or below sea level at that location. There’s a lot of buzz around benchmarks in the geocaching community because there’s almost a hidden history behind them. When you find a survey benchmark, you may be looking at a benchmark surveyed more than a century ago. Benchmarks are a part of human history. They mark our curiosity, exploration and discovery. A “benchmark” is a generic term sometimes referred as survey marks, geodetic marks and control stations. However, survey professionals prefer the terms station or mark rather than benchmark to describe horizontal control marks. Example of a survey benchmark monument. More recently, survey markers are now often used to set up a GPS receiver antenna in a known position for use in Differential GPS surveying. In surveying and mapping of large areas, the curvature of the surface of the Earth and sea-level surface must be taken into consideration. This is why geodetic surveys extending across North America have been developed. They serve as a basis for North America’s horizontal control data. With 2 benchmark locations, triangulation and trigonometry are used to measure the direction, distance and elevation between them. This is called geodetic leveling. Geodetic leveling can even be used to understand the area and volume of the Earth. Horizontal control data provide a rigid framework for map makers, engineers and land surveyors in North America. It makes it possible for greater precision for surveys and locate national, state, county and private boundaries with greater precision. Benchmarks are important to surveyors because they help accurately measure the positions of all land boundaries and modern infrastructure. Who is Responsible for Survey Benchmark Monuments? In the United States, NOAA’s National Geodetic Survey (NGS) is responsible for managing approximately 240,000 stations gathered over the last two centuries. This survey benchmark data is made available through the National Geodetic Survey Data Explorer. NGS developed the North American Datum of 1927 that was defined by the Clarke spheroid of 1866, with its origin at (the survey station) Meade’s Ranch. A more accurate datum was created called North American Datum of 1983 (NAD 83). This horizontal control datum is used in the United States, Canada, Mexico, and Central America, based on a geocentric origin and the Geodetic Reference System 1980. In Canada, Natural Resources Canada’s Geodetic Reference System is responsible for the maintenance of survey benchmarks. In the United Kingdom, it’s the Ordnance Survey and in France, it’s Institut Géographique National. What Types of Benchmarks Exist? There are two main types of benchmarks that exists – “vertical control points” and “horizontal control points”. Vertical control points contain a precisely measured latitude, longitude and elevation. The elevation is usually measured as height above sea level. Horizontal control points simply contain latitude and longitude values. Within these two broad types of survey benchmarks, there are different types of categories for horizontal control markers as described in NOAA’s Horizontal Control documentation. INTERSECTION STATIONS are horizontal control marks with a landmarks that can be seen from a distance. Examples of intersection stations are water or radio towers. These points can be observed with a telescope using trigonometry to determine their position on Earth. TRIANGULATION STATIONS are markers with positions determined by measuring distances and angles from other stations. Reference marks help keep triangulation stations from being lost with arrows on their disks pointing in the direction of their referenced triangulation station. Azimuth marks, coupled with its triangulation station, provides a compass direction of the true north (which is different from the magnetic North). There are approximately 240,000 stations gathered over the last two centuries in the United States. This data is made available through the National Geodetic Survey Data Explorer. From coast-to-coast dating back to 1832, benchmarks have been surveyed using a range of different techniques. Surveyors installed survey benchmarks systematically across the region. New distances and angles were always being recorded between points. Each survey benchmark is stored in the NGS database with its own unique personal identifier (PID) six character alphanumeric code, latitude and longitude. The National Geodetic Survey Data Explorer shows geodetic control stations maintained by the National Oceanic and Atmospheric Administration (NOAA), National Geodetic Survey. Each geodetic control station has either a precise latitude and longitude used for horizontal control or a precise height used for vertical control (units are meters above the geoid), or both. CONTINUOUSLY OPERATING REFERENCE STATIONS (CORS) NETWORK are control stations with permanently operating Global Positioning System (GPS) receivers. 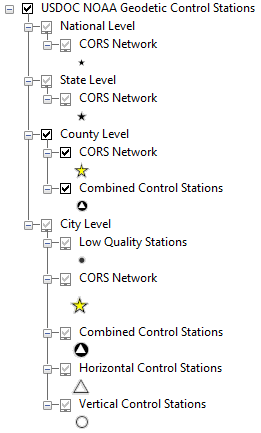 In the NOAA control point dataset, they are identified by the attribute DATUM_TAG = ‘(CORS)’. COMBINED CONTROL STATIONS are horizontal and vertical control stations. LOW QUALITY STATIONS have low quality latitude, longitudes (horizontal) and/or low quality Orthometric Heights (vertical). Low horizontal quality have the following attributes: POS_SRCE = ‘GPS_OBS’, ‘NO CHECK’, ‘HD_HELD1’, ‘HD_HELD2’, or ‘SCALED’. Low vertical quality have the following attributes: “ELEV_SRCE” = ‘GPSCONLV ‘, ‘VERT ANG’, ‘H LEVEL’, ‘VERTCON’, or ‘SCALED’. HORIZONTAL CONTROL STATIONS only contain precise latitudes and longitude. They the attribute POS_SRCE = ‘ADJUSTED’. VERTICAL CONTROL STATIONS have precise Orthometric Heights which measure elevation in meters indicating the height above the Geoid. They have the following attributes: ELEV_SRCE = ‘ADJUSTED’, ‘ADJ UNCH’, ‘POSTED’, ‘READJUSTED’, ‘N HEIGHT’, ‘RESET’, ‘GPS OBS(2006’, ‘LEVELING’), or ‘LEVELING(200)’. 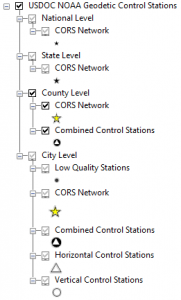 Note: A single station can be classified in multiple ways – as an example having low quality Orthometric Height and be part of the CORS network. The term “benchmark hunting” refers to the hobby of geocaching for historical survey benchmarks. Survey benchmark hunting has carved out its own niche in this exciting hobby. Why do geocachers seek survey benchmark points? When you search for a survey benchmark, you really get to see a piece of history. Some of these points haven’t been visited for decades, even centuries. When you find these hidden gems placed into the ground years ago, they can be documented and shared with the geocaching community. And you have bragging rights in the community. Seek out the nearest survey monument to you. Geocache and discover the history of classical surveying. Benchmarks do not measure anything. They are just a structure (whether manmade or not onto which an elevation has been attached. 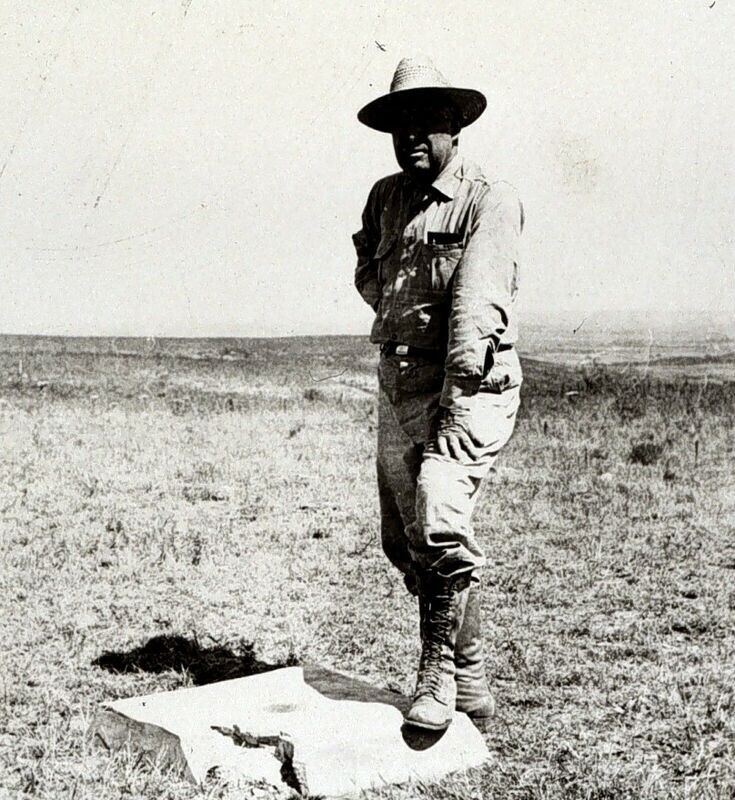 To a land surveyor, the word “benchmark” usually means a monument established which is part of a set of survey observations made for the purpose of transferring accurate information to the structures (points) either constructed or used while survey observations were being made. Humans cannot determine “exact” locations or positions. We are imperfect by nature, therefore our instrumentation is also imperfect. There are so many ways that error occurs during even one observation that we, as humans, cannot eliminate all of them. By making multiple observations, using very accurate equipment in proper working order, we can attain accuracies that are very precise, even to the thousandth of a foot. Surveyors never say that their measurements are “exact”. Benchmarks provide precise orthometric heights. They do NOT necessarily provide precise horizontal positions. 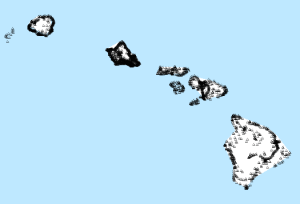 Rather, many have scaled positions from maps. Pull any county in the US and you will see both horizontal marks with no orthometric height and BMs with no “adjusted” a.k.a precise positions. It seems the term benchmark is being used interchangeably with geodetic markers or station marker (we even do it at NGS, (sigh)). You may find our FAQs helpful. How can I log benchmarks that are not listed? I find them all the time, but when I look on the app, Benchmap or on geocaching.com’s website, it doesn’t show up. Is there any history noted with named benchmarks? Many of the early monuments had published data sheets giving horizontal coordinates based on NAD 27. These same monuments now have coordinates based only on NAD 83. I understand that NGS no longer supports or publishes NAD 27 coordinate data, but I need this NAD 27 coordinate data for a research project I am doing in California, Zone 1 . I need access to the original NAD 27 documents that contained published coordinates, and not those converted from NAD 83 that give approximations . Can you please tell me if there is a site where I can still find this NAD 27 coordinate data? Many thanks.